An Eden Hazard 51st minute strike was all manager Antonio Conte needed to ease pressure on himself. Chelsea winger Victor Moses has hailed his club teammates for their slim 1-0 win over host AFC Bournemouth in the English Premier League on Saturday. Moses had limped off the pitch with a hamstring injury during the first half of Chelsea’s 2-1 defeat at Crystal Palace on October 14. The 26-year-old was sidelined for one month, and he is trying to return to full fitness. 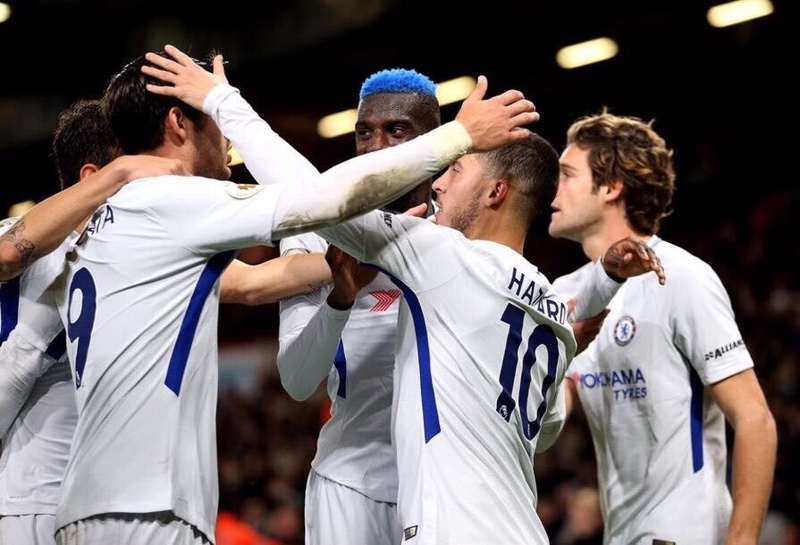 Moses took to social media to celebrate Chelsea’s 1-0 win over a difficult Bournemouth and hailed his teammates for the result. “Another massive 3 points! Well done lads, come on Chelsea! #CFC”, he shared on Twitter along with a picture of Chelsea celebrating their goal. Moses is not likely to be available for Nigeria’s last World Cup 2018 qualifier against the Desert Foxes of Algeria on November 10 in Blida, and the international friendly against the La Albeceleste of Argentina, four days later in Krasnodar, Russia.